The “Suffolk County Bottling Works” was owned by Jacob Hartmann from 1890 to 1902. The “Portrait and Biographical Record of Suffolk County NY” published in 1896 indicated that Hartman started the business in 1890 and was still the owner in 1896. He was also proprietor of the Suffolk County Ice Company. A large pond, once known as Oak Street Lake and later known as Hartmann’s Pond was named for Hartmann. His home and businesses were located adjacent to the pond on Lake Street. The pond supplied the Suffolk County Ice Company with ice each winter. A June 3, 1902 story in the Brooklyn Daily Eagle contains a description of the pond and Hartman’s businesses. Hartmman’s Pond, which is owned by Jacob Hartmann, a bottler of beer and mineral waters, is situated a few hundred feet north of Oak Street or what has long been known as “the new road” and about one quarter mile east of the village proper. The pond is a little more than an acre in size and is fed by springs that flow through the woods north of the railroad track. The pond is surrounded by a grove in which is the residence and grounds of the owner. On the banks of the pond are buildings used by Mr Hartmann for his bottling establishment. The story goes on to say that NYC may buy the pond and use it as an extension of their water system. Hartman sold the business less than five months after this story was printed so it could very well have been the reason he sold out. The October 13, 1902 issue of the Brooklyn Daily Eagle reported the sale. Jacob Hartman, for a long period proprietor of the Suffolk County Bottling Works and the Suffolk County Ice Company has sold both enterprises to George L Lyons of Coney Island and is to retire from active business. Mr. Hartman is a German by birth, but came to this country when a young man, and by hard work, thrift and enterprise has accumulated a comfortable fortune. Approximately one year later, on October 4, 1903, the Brooklyn Daily Eagle reported that Lyons had failed to meet the mortgage payments to Hartmann and the property was seized and offered for sale. 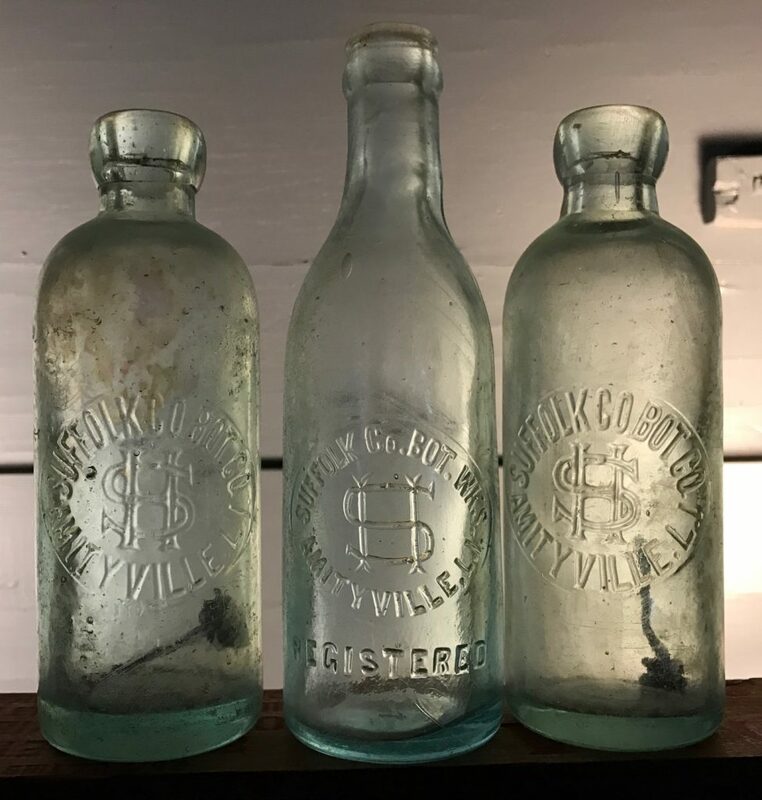 The plant and personal effects of George W Lyons, proprietor of the Suffolk County Bottling Works of Amityville were seized recently by Deputy Sheriff Morris, who will expose them for sale on Thursday. The cause of the goods being seized was that Mr. Lyons failed to meet the payment of a $4,000 chattel mortgage held by Jacob Hartmann. There’s no mention of the business that I could find after the seizure. Today, the area around the lake is named Peterkin Park. I’ve found 3 bottles all together, 2 Hutchinsons and an 8 oz tooled crown. This puts their manufacture date within the 1890 to 1903 period listed above. Previous Previous post: L. Steinberger, 496 to 502 Pavonia Ave., Jersey City, N.J.
Next Next post: Suydam Bottling Co., 135 Suydam St., Brooklyn, N.Y.